By: Adam Shapourian on June 28, 2012. As a public service, it is important to note that Verizon Wireless subscribers can now sign up for the new “Share Everything” data plan for smartphones and tablets; a feature many Verizon Wireless customers (including me) have been wanting for a long time.Announced earlier this month, this plan offers users on a family plan a plethora of options to share not only minutes and text with each other, but now data as well; a first in the cellular industry. To get started on a Share Everything Plan, customers first select the devices they want on their accounts. Then, choose a plan that includes unlimited minutes, unlimited messages and a shared data allowance that begins at 1GB for $50. If you are like me and need more than 1GB of data, you can get 2GB for $60, 4GB for $70, 6GB for $80, 8GB for $90 and a whopping 10GB for $100. These data plans can be shared with up to 10 devices including tablets. Customers adding a tablet on their Share Everything Plan can do so for an additional $10, with no long-term contract requirement. Potential customers of the Share Everything Plan can calculate their estimated cost of ownership by using this nifty tool courtesy of Verizon. For what it is worth, I calculated what my monthly usage would be for two devices with comparable minutes/text usage and a 5GB shared data plan and I would save roughly $10 each month if I made the switch. Add in an extra tablet and the savings are increased even further. 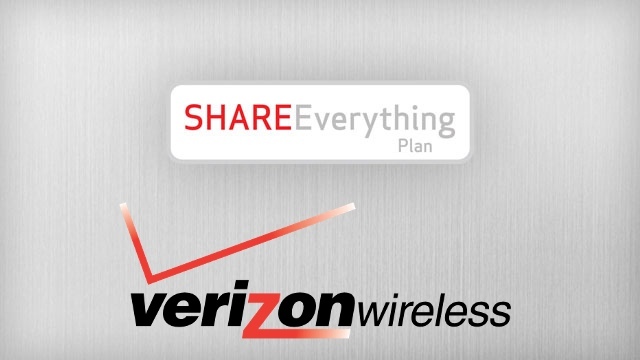 Learn more about Verizon’s Share Everything Plan here. Last updated by Adam Shapourian at August 10, 2012 .